Paul James guided Wolves to the BBL Trophy and Championship play-off title in 2014. 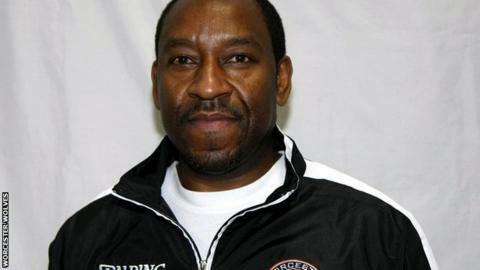 Worcester Wolves have the most united squad in recent years, says head coach Paul James. James released all but one of his players off the roster in the close season but has seen his new-look side start the new British Basketball League campaign with five wins out of six. "We are very much all together in this," James said. "The senior players are the biggest cheerleaders of everyone else and in the past you really couldn't say that." James continued to BBC Hereford and Worcester: "You couldn't ask for a better atmosphere on, or off, the floor - the senior players talk to the students and help them improve. "We're doing things now that we weren't doing at the start of the season, and didn't look like we'd ever do, and it's now one unit playing together." After losing in the quarter-final of the play-offs last season, the 2014 BBL Trophy and Championship play-off winners cut their entire squad apart from one player - guard Disraeli Lufadeji. After suffering their only defeat of the season so far, losing 88-54 at Leicester Riders, Wolves have won at Manchester Giants and beaten Glasgow Rocks and Leeds Force at home. And the manner of their 92-65 win over the Force really impressed James. "That was our best performance so far - and I think it's the first time we've had a Wolves team that's played one of the lower teams and not taken our foot off their throat." James will had a debut to new signing Josh Cameron in Sunday's game at Sheffield Sharks but is wary of expecting too much too soon from the American combination guard. "I don't want to disrupt the rhythm of the team as we're playing some really good basketball but I want to get him out there," added James. "He won't know all the sets but he will get some minutes."